Pura Luhur Uluwatu or Uluwatu Temple is a famous Balinese sea temple in Bali. It is one of the nine directional temples of Bali meant to protect it from evil spirits. This spectacular temple is one to marvel with as it perched at the edge of the rock overlooking the sea as if on guard. The name Luhur means “something of divine origin” and ulu the “land’s end” and watu the “rock” in the old language. The name itself had aptly described what this special temple is all about. Pura Luhur Uluwatu is regarded as one of the six most important temples in Bali along with Pura Besakih. The inner sanctum of the pura (temple) is perched at the edge of steep cliffs which tower over Bali’s legendary surf breaks at the south. Most travelers enjoy the view of this temple from two different vantage points, from both northern and southern part of the area. As one of the key nine directional temples of Bali, Pura Luhur Uluwatu is meant to protect Bali against the evil. 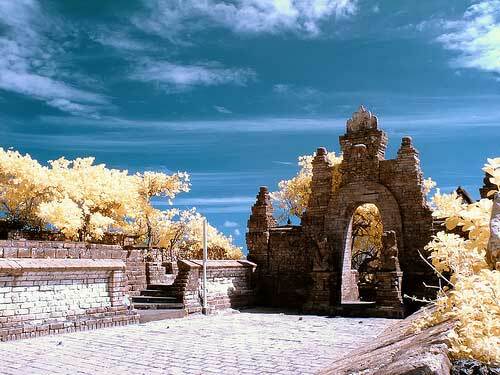 It is expanded in the 11th Century by a Javanese sage, Empu Kuturan. Later another sage from East Java, Dnag Hyang Nirartha is credited to have constructed the padmasana shrines and claimed to have attained moksha here. 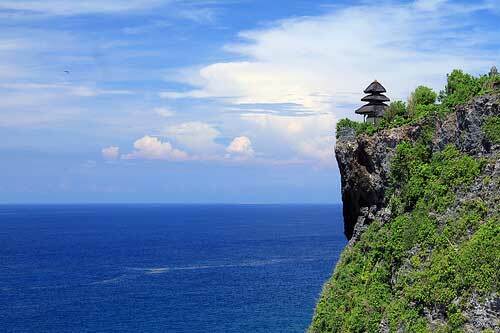 The temple is perched at a staggeringly steep cliff as tall as 70 m over the roaring Indian ocean waves. It is located in Pecatu Village, Kuta South District. 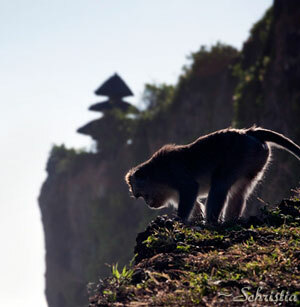 It is at the southernmost of Bali at a place known to tourists as Bukit Peninsula. Uluwatu Temple is one of the main temples in Bali and besides the dramatic view of a temple perched at the steep cliff over roaring sea is all reason enough to visit. The best time to go Bali is July-August as it is the coolest and also driest but naturally peak with tourists. Generally all time is a good time to visit Uluwatu Temple though you may find some rain in the evening during rainy season. 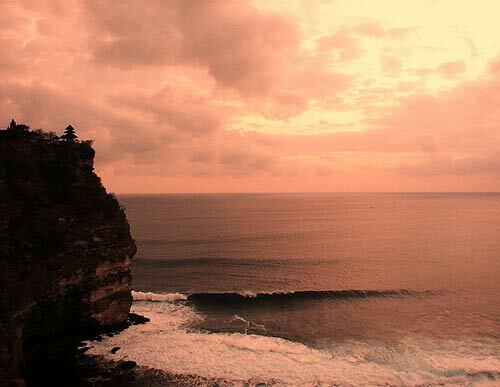 Come between March to September for the best chance of a clear sunset over Uluwatu. The entrance fee to enter Uluwatu Temple is 30,000 Rp (as of 2016). Sarongs are available for rental at the entrance if needed. Guide is not necessary. Open from 9am to 6pm for visitors. For worship purpose it is open for 24 hours daily. From Kuta – A taxi from Kuta to Uluwatu will take 30-40 minutes and cost about 150,000Rp one way. You can consider hiring a car for the day in Bali for other excursions since all the tourists’ spots are far from each other. Uluwatu Beaches – well known among surfing enthusiasts as there are good surf spots like Uluwatu, Dreamland and Padang-padang. 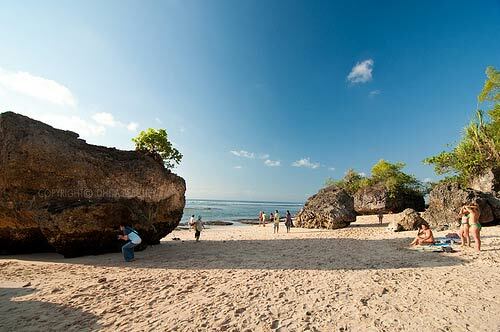 They are also part of the Top 10 Best Bali Beaches . Tirtha Wedding Chapel – many people choose to marry here in Bukit Peninsula, Bali as the stunning and modern chapel comes with a romantic beach front. Numerous resorts offer wedding package to here. Check out our Top 10 Must Visit Places in Bali and Top 10 Things to Do in Bali. 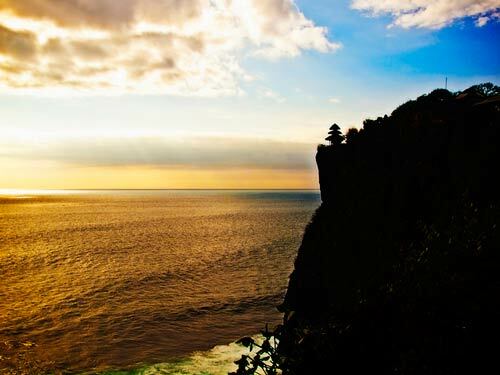 All travelers recommend the sunset trip to Pura Luhur Uluwatu. The sight of the sun setting over the dramatic temple by the cliff is a sight to behold. A note of caution about the monkeys as if you are unlucky they will come and grab off your small belongings. Therefore, keep small things like sunglasses and camera in the pocket at all times. 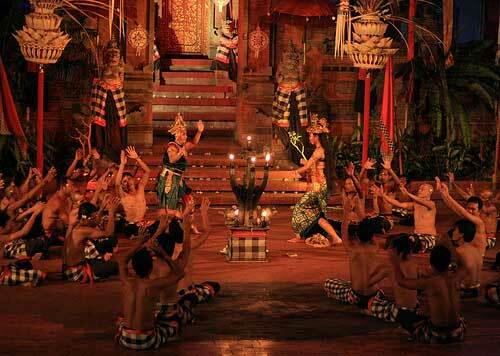 There is also a Kecak Dance performance held everyday here at Pura Luhur Uluwatu Temple and many travelers recommend it as one of the things you must do in Bali.